Our most versatile pants. Stretchy, stain-proof, and incredibly durable, the AT Slim Rivets are built to move with you no matter the weather or occasion. Truly, the one pair of pants that you can wear day-in and day-out no matter the weather or the occasion. 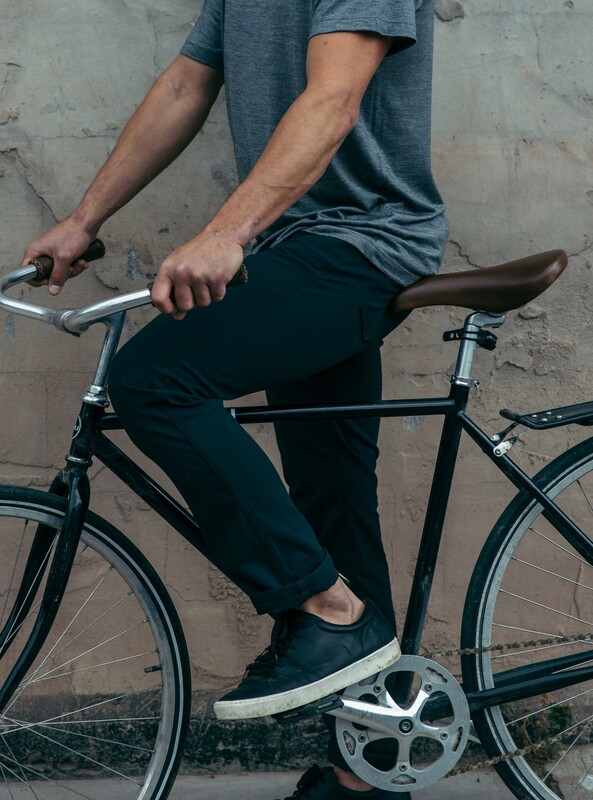 A pant built for life, sport, and travel that can be worn more and washed less, cut lean and ready to move. The AT Slim Rivets are a tougher, more comfortable take on one of the most simple, versatile garments in history - a five pocket pant. Tough enough to handle life outdoors, clean enough for the office, and comfortable in the broadest range of possibilities. AT Slim Rivets are a modern update on the 1873 style, cut from an innovative, extremely durable, stretch nylon with air-texturized fibers for a supple hand feel that makes them both lighter and more durable than cotton denim. The AT Cloth sheds water in a light rainstorm, dries extremely fast when wet, and still looks great covered in desert dust, or daily grime. The five pocket pant, elevated. These are the perfect pant. So well designed and thought out. The material is incredible, I wreck my mountain bike at 20 mph in the slim rivers and there was no damage. I own 2 pairs. These pants impress for sure, and I was excited to see that the process for exchanging was simple, fast, and free when I discovered that I needed the next size up. Just got my pair last week. Have worn several times. Great fit. These are going to be perfect travel pants. Can wear on the plane, with a sport coat, riding a bike or trekking. Looking forward! I have owned these pants for a week and I have worn them more than I should admit. They are great for everything from hiking to going out with friends. Durable and waterproof, they are an awesome pant for adverse weather. 5 Stars. AT Cloth - We searched long and hard to find the perfect fabric for a five pocket pant. We needed a fabric with structure. A rugged cloth that breaks, not drapes. What we found is an air-texturized rugged nylon canvas with just the right amount of stretch. A fabric that moves with the body, sheds rock abrasion, and is ready for just about anything. The fabric is finished with a nano-scale durable water repellant to stay dry in a light rain storm, or dry quickly if they do become wet. The Rivet Pants are designed and sized for a flattering and slimming yet comfortable fit. For reference on sizes and measurements see our size and fit guidelines. Western Rise offers free returns and exchanges for unused items up to 60 days so you are always covered. For more information visit Returns/Exchanges page. Water Repellent Treatment- To reactivate treatment machine dry on medium heat or iron on low heat no steam. Do not dry clean.